I am drowning in darkness. My limbs submerged in inky tar, my lungs asphyxiated by the stench of death's hold. My eyes see nothing but black. Don't look into my eyes, for my demons will eat you alive. My devil inside will feast on your soft flesh. His jagged teeth will tear the meat from your bones and drink the light from your soul. His scars will turn the innocent into sinful and drag you into his dark pit of hell. No light lives within this disfigured shell. I am a vessel for pain. It holds me close like the arms of a lover and whispers to me in the twilight. They say the devil was once an angel. There is no angel inside me. I do not seek repentance nor forgiveness. I do not crave things as weak as love. My desire for her is purely selfish and once my appetite is sated she will be unlucky to leave with her life. When she looks into my eyes, my demons will eat her alive. "The saved girl and the killer. The assassin and his trophy. Grim and Calliah." 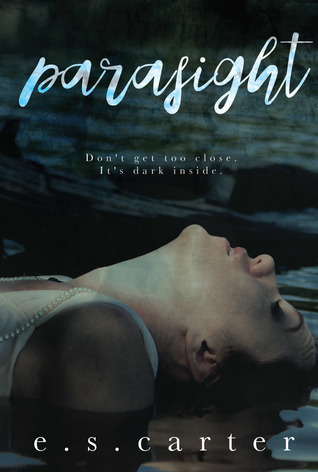 Parasight was just as I expected it to be: dark, twisted and pretty disturbing at times. After reading Feyness (the first book in the Red Order series) I already got a taste of ES Carter's dark side, and boy she has one hell of a dark and twisted side to her. If you read Feyness then you already met Grim, who is the main character in this book. He is one scary individual who loves to kill and torture. I couldn't wait for him to get his own book, but was wondering what type of woman would be his perfect match. In my opinion Calliah was definitely a right match for him. The moment they meet there is this unspoken connection between them. We get to see a whole nother side to Grim that I didn't expect him to have. I was really pleasantly surprised the way Grim transformed, but also the way he was still his dark and twisted self. "From afar we likely look like lovers having an intimate moment, when, in reality, we are two broken people learning to accept the other in the only way we know how." I am going to be honest, the prologue was very disturbing and that scene broke my heart. But it does show you where Grim is coming from, why he is the way he is. I think it was essential to the story to get a good insight into Grim's mind and behavior. Calliah also didn't have a loving and sweet past, the things she went through were heartbreaking. Both of them had been through hell and back but were still very strong. Especially Calliah, her strength was very admirable. She also didn't let Grim intimate her, which surprised Grim, because he is a killer that is feared my many. The only problem I had with this book was the time between Calliah and Grim. In my opinion this book was too short for them to fully connect as a couple. I was just missing time alone between them. As individuals they did a lot of growing but as a couple much less. I did enjoy the suspense in the book a lot. And the new character that was introduced has piqued my interest a LOT. I just can't wait for the next book to release.